With merchants striving to achieve the best and most consistent customer experience across all channels, many businesses are trying to balance all of their systems as they continue to scale and expand their reach. At the heart of a typical B2C retailer, B2B manufacturer, or pure-play etailer experiencing complexity as they grow should be the an ERP solution. Designed to manage various aspects of day to day operations as well as business-critical functions like managing orders from multiple channels, managing customer information, allowing for visibility across multiple warehouses and/or bricks-and-mortar points of sale, an ERP is a critical component to ensuring your business’ path to growth remains smooth and unrestricted. Implementing an ERP is just the start in fully incorporating this powerful piece of technology into your broader back-end technology stack. First, while an out-of-the-box ERP can handle many functions for most businesses well, your business may require a few add-on modules that extends the systems’ overall functionality to meet your unique business needs. It’s not uncommon to see customizations made to the ERP itself in order to make more precise modifications or to add a new feature to be used as per the business’ requirements. All these modifications are still within the closed system of the ERP. When it comes time to extend the reach of the ERP into the holistic technology stack, many ERP providers themselves refer to external experts. Experts like VL OMNI are well-versed in integrating and automating data movements in to and out of ERPs, specializing in the complexity of customizations on these platforms in particular. There are many options to integrating your ERP system’s data, and ultimately it’s the end-user of the application who is tasked with finding the right integration solution for their needs. It’s important for merchants to keep in mind that many ERPs do not include integration, so be sure to factor in the additional cost and timeline of this final yet critically important piece of the puzzle. Integration platforms as a service (iPaaS) solutions like VL OMNI offer enormous flexibility for many scaling merchants. Especially with an incredibly functional ERP like Microsoft (MS) Dynamics NAV, merchants with limited time and not enough internal resources to custom code and maintain their own solutions not only save on development costs by outsourcing to an expert iPaaS provider, but also understand that it takes an expert integrator to pull together your best-of-breed applications and make everything work together seamlessly. An iPaaS company truly worth their weight will provide a strategic approach to data integration, offer multiple endpoints, have flexible communication, and provide a scalable solution — at minimum. Dynamics NAV is a great ERP system that has been tailored to fit very unique industries, including the permutations of the platform like justfoodERP, Drink-IT, and LS Retail. But with this much potential under the singular umbrella of NAV, the “one size fits all” approach to integrating your instance of NAV will not likely be a realistic expectation. Merchants selling across many channels, including owned properties like Shopify Plus, marketplaces like Amazon, and in physical bricks-and-mortar stores meet all the requirements for a more complex and robust data integration solutions for their NAV ERP. It is not a secret that Shopify Plus is empowering merchants take their ecommerce growth to the next level in a big way. But how are top merchants on Shopify Plus managing their complexity outside of the ecommerce platform and integrating it with their other powerful applications? In my experience, many businesses are still becoming tuned in to embracing an ecommerce strategy with the end consumer in mind. With tremendous ecommerce growth potential housed in a platform like Shopify Plus, cutting corners with custom coding or by using a plug-and-play integration is definitely not the best approach to scale a fully integrated environment. (In fact, Shopify Plus does not have any native plug-and-play integrations like their core iteration does, instead choosing to rely on expert partners for this crucial component.) Instead of gambling with these low-end short-term solutions, you could instead have a fully integrated and automated technology ecosystem, pushing and pulling data like orders, shipment, customer information, invoices and more not just to and from Shopify Plus and your NAV ERP, but from a single point to many in a single movement in real-time. That’s the difference. After all, first impressions for your end customer only happen once. Best make a great one, and great data integration is a big part of that puzzle. 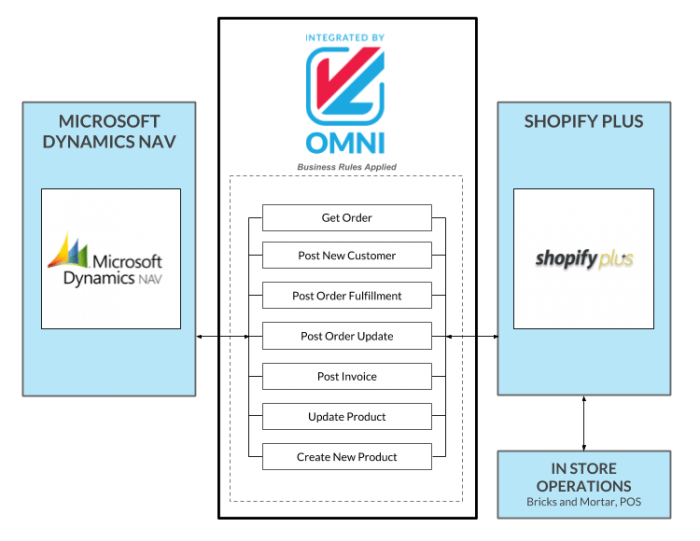 But the need for complex, agile, and scalable integration doesn’t end with Microsoft NAV and Shopify Plus. VL OMNI’s Connectors are designed to be modular: any one Connector can be integrated with any other Connector from our library with minimal configuration and no custom coding. With over 300 Connectors in our library and more being added constantly, VL OMNI is quickly becoming the one-stop-shop for complex integration projects in the omnichannel retail community and beyond. So if you don’t see your application in our Connector Library, reach out to us — there’s always a ton going on behind the scenes at VL, and we’re happy to work with you. Best yet? 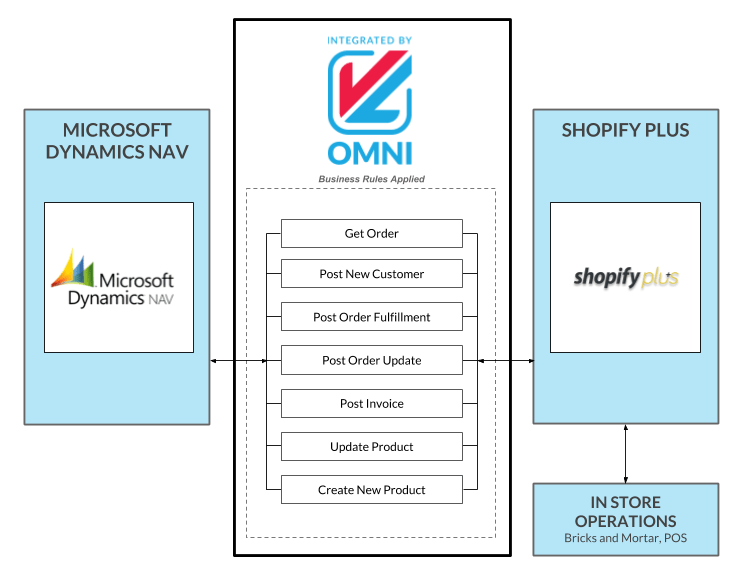 : VL OMNI is the only GDPR compliant integration platform for Shopify Plus merchants.